We know that you are not really a bad guy...you happen to be just a bit misunderstood...by everyone. But you have a heart of gold, and we can see that. Hey! That sounds just like our good friend, Edward, who lives up in an old abandoned (creepy) house above our (equally creepy) pastel suburbs. Maybe we can have you both over for a barbecue and you could channel his look this Halloween! He’d like that. Though, when you're dressed as Edward Scissorhands, you may not possess the same in-demand hair cutting skills that he does. 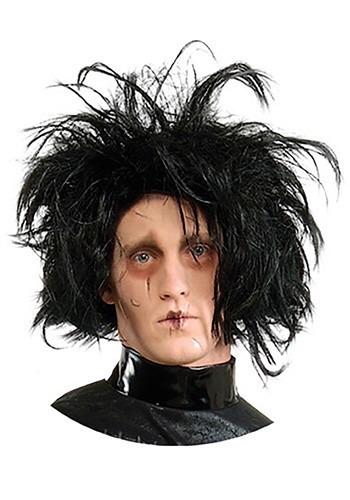 To avoid mishaps, you can get this Edward Scissorhands Wig and nail Ed's look without giving yourself a bald spot. We don’t know what to tell you when folks start asking you to design elaborate hedges for them. Perhaps tell them that your blades need sharpening and you’re not accepting new clients.